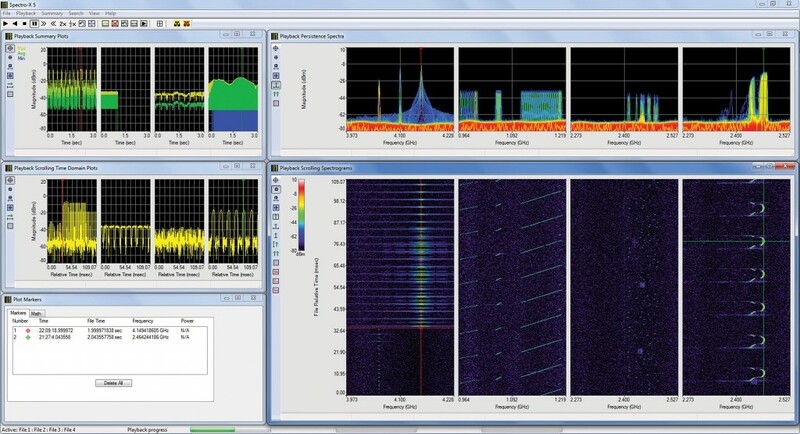 Since Spectro-X signal analysis software was introduced in 2013, it has become a widely used tool for developing and testing radar, ELINT, SIGINT, ECM, ESM, commercial and military communications systems. It is also used by surveillance agencies for post-signal-capture analysis, interference detection and analysis, and by spectrum managers for evaluating broad swaths of frequency. The latest version of the software adds to its functionality as well as ease of use in response to the increasingly broad and complex challenges posed by dense electromagnetic environments and advances in technology. For those new to Spectro-X, it is Windows-based software designed to help solve the problems inherent in detecting and analyzing signals in signal capture files. It can simultaneously analyze up to four files of any size over any range of frequencies with file alignment of +/-1 sample, allowing the user to “zoom in” to signals of interest contained within files containing hundreds of thousands of emitters (Figure 1). Without this capability, finding signals in recordings that represent very long capture times would be extraordinarily tedious and in some cases impossible within a reasonable amount of time. 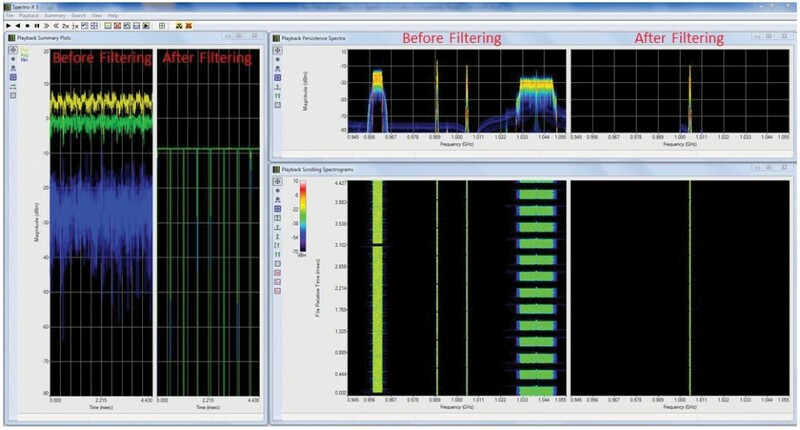 Figure 1: Spectro-X allows four spectrum files to be simultaneously viewed and analyzed. The user can choose frequency, time, and magnitude plots for each channel. The files of signal activity can originate from over-the-air signal captures from X-COM’s IQC5000x Series or IQC91000A spectrum capture and playback systems or from custom spectrum files created in MATLAB or other software. It has four different search engines (carrier, wireless standard, arbitrary waveform, and pulse) that allow signals of interest to be rapidly found, after which the user can focus on specific sections of the file in frequency, time, or both to find signals of interest. A file including only relevant portions can then be exported for demodulation and detailed analysis in a file format usable by vector signal analysis software such as Keysight Technologies’ 89600 or SignalVu from Tektronix. In addition to this core functionality, Spectro-X provides a rich set of characterization capabilities for pulsed waveforms, including rise and fall times, pulse width, pulse repetition interval, peak and average power, and carrier frequency. It also allows the four files to be aligned in time so that comparisons can be made among them. The files can be offset in time and compared, placing markers on all four plots, which is helpful when evaluating a radar system (for example) on a test range to validate its performance during multiple flyovers. In addition, as EMI and TEMPEST testing requires measurement of RF emissions in both horizontal and vertical polarizations as well as antenna azimuth and elevation, Spectro-X saves time by allowing all of these measurements to be viewed and analyzed simultaneously. While a spectrogram is an effective way to three-dimensionally view the characteristics of a signal in time, frequency, and amplitude at a specific frequency, the time dimension becomes smeared as frequency resolution is increased. This requires additional types of measurement displays to be employed to make precise measurements. Spectro-X lets the user mark the start and stop times of an event in the spectrogram with precision to the sample level and as the marker is moved in one domain, all other measurements in the same domain move as well. This provides a much more intuitive way to view changes in signal activity than a spectrogram alone. Real-time event markers: Markers in the capture files from X-COM’s signal recording systems are now displayed by Spectro-X so users can view them during analysis to precisely pinpoint the timing of spectral events. Relative and absolute sample counts: X-COM’s flagship IQC91000A Series signal record and playback system includes markers that contain both relative and absolute sample counts. These are essential metrics when used with the system’s gated trigger capability that are necessary for tracking timing information from pulsed, time-multiplexed, TDMA, interleaved, intermittent, and burst-modulated signals. A relative count accumulates samples regardless of whether the recording was made in a continuous fashion or with a gated trigger. In contrast, an absolute sample count accounts for time gaps that occur during gated triggering. This is illustrated in Figure 2. That is, the absolute sample count accumulates samples continuously, but marks their absolute time so the user knows when they actually occurred. Both counters start at 0 and begin incrementing with the first gate trigger, but the relative sample count does not increase the count when the recording is paused during a gated capture, while the absolute sample count calculates the absolute time the sample occurred. Using the example of a monopulse radar that sends out shorts bursts of energy and then listens for a long period (such as 10 pulses and a 1-s listening period), the system is actually transmitting far less than it is listening. Using a gated trigger, a system such as the IQC5000x or IQC91000A records the on-time of the pulses and then pauses until it detects the next burst of pulses. The file will contain a list of contiguous samples (the relative sample count) but will be discontinuous in time; there is “dead time” between off-time of the last pulse to the on-time of the next pulse. Inclusion of both relative and absolute sample counts is very useful when the recording is processed using tools such as MATLAB because the recording size can be dramatically smaller than if the file was captured continuously (i.e. including the dead time) while maintaining absolute timing references. These absolute timing references are also important for pulse timing measurements and correlation with other equipment in the lab or on the range. Enhanced features for pulsed signals: Many if not most of the signals that Spectro-X must operate on are some form of pulsed waveform. As a result, features that make this process more precise and versatile are welcome. The latest version of Spectro-X adds to its already formidable array of pulse search functionality in several ways. The 3-dB point of the pulse is now used as the start and end of a pulse, which provides more consistent pulse widths regardless of the thresholds chosen by the user. Pulse frequencies are now computed at 10%, 30%, 50%, 70%, and 90% of each pulse along with the overall pulse frequency. This helps to determine the type of pulse, such as CW, linear chirp, non-linear chirp, or an unknown type. In addition, the total number of phase transitions are now computed and included in the saved pulse results, which is important in order to quickly determine whether a pulse is modulated. That is, if pulse linearly changes frequency at each 10%, 30%, 50%, 70%, and 90% point, it is almost certainly linear chirp as a nonlinear chirp has random phase changes. A pulse with a large number of phase transitions has modulation while a square pulse will have fewer phase transitions introduced by Doppler effects, identifying it as an unmodulated pulse type. While this capability does not identify all characteristics of the pulse it provides a fast way to discriminate between a modulated and unmodulated pulse. Enhancements to waveform search: The ability to perform waveform search is one of the most powerful tools within Spectro-X. It makes it possible to correlate the occurrence of arbitrary waveforms to an IQ reference file created in MATLAB or extracted from the original data set recorded by an X-COM record and playback system. Now Spectro-X includes a highly-selective filter that lets the user eliminate unwanted signals in the data, which is the only accurate way to perform a waveform search when two signals occur at the same time but at different frequencies. In addition to these enhancements, waveform search results now show the file name from the library that matches in the search. Filtered IQ data export: The addition of a very selective filter allows data sets from an RF recording to be exported without unwanted frequencies (Figure 3), a major enhancement for time-domain analysis and RF playback that also reduces file size. Dedicated control of the summary plot: This measurement window shows a time-domain profile of all events in a recording and now has dedicated controls in the top navigation bar that streamline the process of locating signals of interest and zooming in to view signal behavior. The new section lets users start and stop the summary, undo its limits, and set summary plot and playback auto-limits. A 30-day trial version of Spectro-X software is available along with a self-guided demo, videos demonstrating various features, and other technical resources, at www.xcomsystems.com.